How Does TSA Take to “Paperless Boarding Passes”? Interestingly enough, there’s this new fun little thing that the TSA is pushing which really shows that they’re actually with the times. 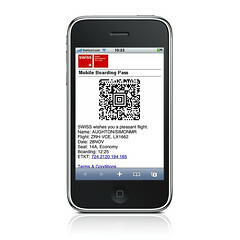 While most people still use the paper boarding passes, you can now have it sent to your phone. What it does, is that it actually sends you an image of a QR code I believe, of which is then scanned at the TSA checkpoint. They use one of the red bar code scanners so it doesn’t really get effected as much by the reflective screens on smart phones. What’s neat about this technology isn’t just because it’s “green” since there’s no paper, but the fact that the government is finally getting on board the technology train WHILE it’s going. Not like ten years behind. Usually you don’t see things like that except in military and advanced research labs. I find that absolutely fascinating. While I had the opportunity to use it more recently, I was hesitant mainly because I didn’t want to hassle with it if there were airports that had screeners that were not trained to actually deal with the passes. Even if the airlines are pushing it, it doesn’t necessarily mean there are untrained staff out there. So I decided to observe and see for myself. It happened that there was one lady in front of me at Newark that used this system. It was actually very quick and easy and definitely put my mind at ease that perhaps this is the next thing I’ll adopt while I travel. Nothing like getting rid of the abundance of boarding passes that one has to carry these days along with all of the advertisements and the weather and what not. In all honesty, while it seemed like a pretty good idea, I usually am annoyed that they print all my boarding passes on separate pages with a bunch of junk on them. Just print them all on one page! I’m actually pretty happy that so far my observation of the paperless boarding pass has been a great experience.